It's Illustration Tuesday. Often our career paths are not a straight line. There may be slow starts and turns and detours. 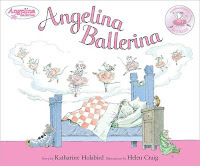 In the video below, Helen Craig, illustrator of Angelina Ballerina, describes hers. Read here more about her background, and about Angelina's author, Kathering Holabird. She did some other things, too, before writing. All those experiences enrich us. Then look at where being in a book has taken Angelina--right to the real ballet!